Future TV and Naharnet estimated around a million Lebanese filled Martyrs' Square in downtown Beirut today to commemorate the killing of Rafik Hariri. One year ago exactly I woke up at the same time I did today and read the news of an explosion in downtown Beirut. Less than an hour of anguish later, I and millions of others learned the news of his death by a powerful bomb in the very quarter of the city he rebuilt. Today is a day of remembrance that comes after much disillusionment. As I watch hundreds of thousands waving Lebanese flags, albeit with less purpose than a year ago, I can’t help but wonder: now what? When Saad Hariri, Walid Jumblatt and Samir Geagea held hands and addressed the crowds directly, it became clear they were seeking a mandate for a stronger and more potent alliance. A response of sorts to Hizbullah and Aoun that drew sharp political boundaries. In his speech, Jumblatt accused Bashar of being a terrorist, and demanded the Lebanese army be sent to the border region and the southern suburb. Saad said there will be no compromises. The hope is that this renewed alliance, which should no longer go by "March 14", will stand up for Lebanon through action and not just words. As I said somewhere else, 500 000 Lebanese is still better than 1000 000 fifth columnist. "having another opinion with saad interview yesterday that tried to make it political, it means he failed to make it political as it still showed to be a commemoration. 3- and many not comming as the convergency of interest btw them and the future is over. i was tempted to go but i didnt on my side, i m belonging to the third category as far i m not feeling myself to be next to the people that were pro syrians for so long and just turning to be against syrians since the equilibrium of the forces changed in 2003"
Great post - I've linked to you from my blog. Whether that's one million or 500 thousand protesters, it's a BIG demonstration by anybody's standards. So what do the numbers mean? To use your own words of a few days ago are these citizens or are they subjects? As long as the fealty is to feudal lords, the clergy and traditional leadership then it is difficult to expect real change. Marginal change is not enough. According to the end of day official estimates released by the police in Lebanon, the number of protesters was around 800,000 and organizers believe it is 1,000,000. Therefore it is somewhere in between. I also want to comment that it is a shame that you and some others don't look at this as a positive for Lebanon and just another step forward towards our sovereignty. It is a shame that there are those out there that just follow leaders blindly and do not question their strategies as self serving and harmful to our nation. It is a shame that some of those who have always carried the mantle of independence from Syria are the first to be corrupted by the prospect of power. I do not have any affiliation with the FM or any other political party, I just have loyalties to a struggling nation seeking a chance. Stop following blindly and realize that siding with the enemy is catipulation, and the presidency is not worth your dignity. depends on the aim of theses of why the majority of people came for. as souvenir for what happened? how much people joumblatt can mobilise since it s a feodal leader. how much the future can mobilise since he replaced the traditional leaders. i just know one person that is christian that went there from all the christian's people i know in kesrouan, metn and beirut and since her dad was working for hariri, she was feeling the obligation to be there. this is how we can use numbers, to try to guess why that commemoration and not manifestation was a failure instead of being the success that they are claiming it to be. if we manifestated last year it was for the freedom of speech , as u re still signing to be anomynous, are u afraid of something? i m not believing in this million, as far i prefer to rely on foreign occidentals medias instead of the brainwashing pro governemental medias LBC, nahar, future, the truth is never black, it s never white, the truth is always gray. about the internal security forces, maybe they got now the orders to change the numbers . we have 2 speeches, one for abroad and one internal speech, like that fatfat interview in liberation that was then denied by himself. i hate when i m hearing people: u re not with us therefore you re against us, they dont understand that free opinion is a right, free exposure of that opinion is not only a right but a must. I am not hiding anything, i just never post and didn't feel like registering...but i made an exception this time. 1. the numbers I have seen are not from Lebanese media, I don't live in Lebanon so I don't watch LBC or Future. What I mentioned was broadcast on the news here in the US, albeit all media is biased but we have to make a decision based on their reporting. I will note however that your numbers came from earlier in the day and estimates do change when authorities have the time to review photos, etc. 2. Why is it that people resort to the fear of the unknown to maintain the status quo? If anything we should have freedom from fear and spur change in a dictatorial regime. If a new democratic regime in Syria is a democratic one , yet Islamic then so be it. A question to you...why would an Islamic Syria invade us again? The current regime has more to gain in Lebanon than any future one, it took 20 plus years to infiltrate our societies and institutions like this. 3. I never said you are either with us or against us. I just stated my opinion and responded to you out of respect of your opinion. I never insulted you, I just took the opportunity to share my thoughts, the same way you did. Discussion is healthy don't you think? I wrote my earlier post because i saw that you were trying to dampen this blogger's enthusiasm for today's events by trying to disclaim the number of participants, and I found new and relevant information that supports the organizers' numbers. Even by US standards, 500 000 is a huge number. Proportionally, it is the equivalent of a 30 million demonstration. It is a great achievement for Lebanon. Aounists and Hezbollah's militiamen will not succeed into transforming this happy day into a defeat. Look at the picture: it's february and the weather is sunny. Not a coincidence. "i m not believing in this million, as far i prefer to rely on foreign occidentals medias instead of the brainwashing pro governemental medias LBC, nahar, future, the truth is never black, it s never white, the truth is always gray." Hey you can rely on Manar, aka the orange truth. They said that the event was attended by 2 babies and one old lady. FE, I guess you're a Aounist. It is very pityful that you keep attacking the lebanese media just because they don't agree with your politics today although they were the ones that risked everything to keep the hope alive during the last few years. I think you consider that NBN and Manar are beacons for freedom for speech. by pushing to overthrow the current weak regime, and not timing it to a transition processus, we would get an islamic regime in syria. it ll be an obligation for any kind of regime in syria to get its influence back on lebanon since all the coup d etat in syria were prepared or came historically from lebanon. hafez el assad regime now was stable because he was controling lebanon. of course we ll need to disarm the hezbollah but lebanon doesnt have the army to disarm it therefore we need a processus to calm the shiit componment, and this comes from removing the threats to shiits, among them the israelien threat therefore through a negociation process giving back the sheb'a farm and by disarming the palestinians before getting hezbollah s weapons. i m not agree with the future mouvement on theses issues as i m feeling also they are lying on many issues. i used to work in 2001 for a weekly report, i was dealing with confidencial reports inside a well known instutition, i was writing articles and many of them were refused? why bcz everytimes they were telling me, u cannot say that, yes its true but our shareholders wouldt accept. showing me long time before that 5 of february that threat. coming from that point, i putted back everything in question, i globalised my thoughs not only for lebanon but for the whole region and this is the result i have reached. 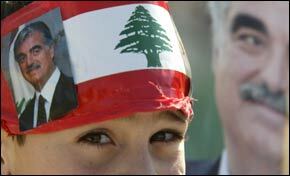 i dont care about an agonising syrian regime, i care about the future of lebanon. i wouldnt like that all the moderated lebanse would live this country because of fanatism as this fanatism is a trend in the region. we should always put our heart aside when it comes to politic otherwise the 5th of sunday was about to become a catastrophy and we have to think with our brain instead of our heart. see what i wrote up, i m doubting of all the kind of the local information. french eagle stop being so bitter! TF1 just reported one million! Is that good enough for you. God you Aounists will go to any length to get some credit! 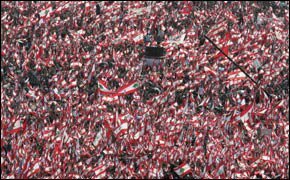 One million Lebanese disagree with his selling of his soul and the principles of the FPM, for the sake of being president! Can we just make him President of his villa in Rabieh? would that satisfy him? /mdr u re doing all the blogs or what? "TF1 just reported one million! Is that good enough for you." Until the General goes down there and count the Christians there himself (assuming he can count), I'll maintain that there's (at most) 666 Christians at this commemoration. I used to be an avid reader of Lebanese blogs but since that idiot frencheagle started farting theories about global "islamism" as he put it, I think I'll stop wasting my time and do some work (I'm at the office). Oh Frencheagle, wake up and smell the humus. You are idiots. They are playing with us the way they want. Dumb Lebanese. woops, thanks Lazarus! I fixed the links. Aounists are going crazy, jumping from blog to blog to diminish the significance of today's demonstration. But all your efforts are in vain oh worshippers of Alexander the Aouni, your silly leader and zegular movement just got a big slap in the face. 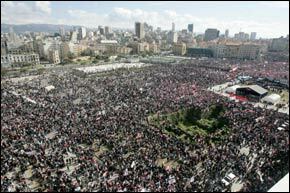 Well done March 14 people, you showed them that you still represent the majority of lebanese and have their support. Now it's time to act, let the cry-babies yell and scream "wahhabi" and "petro-dollar" all they want, as they say in arabic "al qafila tasir wal .... tanba7". Size does matter but at some point it is irrelevant. I hope we can all agree that the FM has made a respectable demonstration regardless of the count. Can they move beyond their demand for the Truth? How long can the Lebanese support their program economically? Despite my distaste for Aoun, he has cleverly put himself in the position of being the only person that can bridge the divide in current Lebanese politics. Can anyone explain why the FM leaves Lahoud in power when we can have Aoun as President and move on with our affairs. This gridlock only serves their leaders . "Can anyone explain why the FM leaves Lahoud in power when we can have Aoun as President and move on with our affairs. This gridlock only serves their leaders . I agree with Issam on that. Better to have this idiot Aoun than Lahoud. Dude, did it ever occur to you that both of these “reliable sources” you’re quoting from were 100%-owned Saudi media with a blatant conflict of interest? Would you have trusted the Pravda to publish accurate figures on say the number of demonstrators in Gdansk back in the Halcyon days of comrade Leonid Brezhnev? This anniversary has become too politicized and it has disenfranchised those opposed to the present Saudi-backed government. I don't see why demonstrators would denounce Iran. Syria yes, but Iran no. Victorino and straight shooter. I am really tired of you both. Victorino you lack originality and bore me to death. Straight shooter, the time is now to stop lecturing us about stuff you obviously don't know. I have had it with your gullible defense of everything Iranian. I am not interested in your consistently ignorant views. You mean Victorino's lame babble about everything Saudi-owned isn't the best analyses ever? Yawn yawn. We're not interested in your petty comments Vic. haha i have a question. If 500000-1mil lebanese are out on the streets playing or remembering or whatever it is they do, whats happening to the rest of the country? I mean its alright to take a break if your country is runing on petrol but with ethanol, lebanon needs to focus more on getting itself into shape than going out every other week to protest or remember. + We've heard all this rhetoric before...syria blah blah, unity blah blah, lebanon blah blah. We need to see things besides these thress baldass figureheads behind glass screens. And until then, everyone get back to your shop and do some work and get this economy moving. I estimated it to be at least twice as large as the one on March 8th of last year. "dr" de la vega I hope that the wahhabis are not also reponsible for the demos that happenned in Iran, or in Syria where everything is tightly controlled by the regime. People on this Blog criticize the Revolutionary Guards Iran sent over to Lebanon from the Israeli invasion of 1982. If it wasn't for the Revolutionary Guards, the Hizbollah would have never been able to drive the Zionists out of Lebanon. I don't understand why people here have such an intense hatred for Iran. Iran gives hundreds of millions of dollars to Lebanon's impoverished Shiite community and has had its diplomats kidnapped and tortured by Lebanese terrorists. This is no way to strengthen the historically close Iranian-Lebanese relationship. Being a Shia Muslim is one thing, and supporting Iran is another. You are free to do both, but you cannot base your support for Iran on its alleged role as "leader of Shia islam". Iran's brand of Shia Islam is based on Khomeini's Vilayat al Faqih. My advice to you is to read up on the history of twelver shiism. Not all Shia agree or follow Khomeini, inlcuding some Iranians, and many Iraqis and Lebanese. I recommend Moujan Momen's "An Introduction to Shi'i Islam". Thank you kindly for providing me with some references. I appreciate your help very much. "The shiiite movement in Iraq" by Faleh Jabar is another good read. Thanks for the reference. I appreciate it.